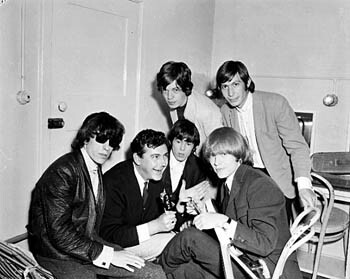 Stan Rofe (second from left) talks to The Stones backstage at the Palais Theatre, St Kilda. The 1965 tour was a package tour with Roy Orbison and The Newbeats. There were different local support acts in each city. Parts of the Sydney leg of the tour were filmed by Movietone News and screened in cinemas. Footage in "Stones Roll Down Under" included their arrival at Kingsford Smith Airport, part of the airport press conference Sydney and part of the performance of Not Fade Away from their first Sydney show. - arrival at Sydney Kingsford Smith Airport + Press conference. - two radio interviews including< 2UE, Sydney. January 22: Manufacturer's Pavilion, Sydney RAS Showground (2 shows). Support band - Chris Hall & The Torquays. The Torquays took over from The Missing Links, who were sacked by promoter Harry M. Miller the night before the show. The Easybeats also auditioned for the Sydney show but were turned down. Set list included: Not Fade Away, Walking The Dog, Under The Boardwalk, Little Red Rooster , Around And Around, Heart Of Stone, Time Is On My Side and It's All Over Now. - Palais Theatre St. Kilda (2 shows) Support: Ray Columbus & The Invaders, The Flies. - Palais Theatre, St. Kilda (3 shows) Support bands: Ray Columbus & The Invaders, The Flies. - Australian radio (3KZ) - interview with Neville Wragg and Stan Rofe. - recording of New Zealand TV ads and raadio plugs for the New Zealand-shows. - Rongotai Airport - press conference. - Press conference incl. interview with Jagger + Wyman.